This painting was my interpretation of another photo that Bryan took while we were at the Simonstown Waterfront. Very simple but stunning. Thanks again Bryan! For those visitors to my blog who may not have heard of Just Nuisance here is a little background. 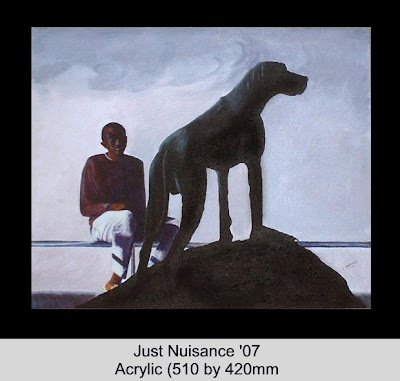 Just Nuisance was a Great Dane, born in Rondebosch, a suburb of Cape Town. He is reputedly the only dog ever officially enlisted in the Royal Navy. He served at a Royal Navy base in Simon's Town. His service record was apparently somewhat blemished by his frequent absences, without leave and for refusing to leave the pub at closing time. It is also reported that he was once sentenced to have all bones removed for seven days for sleeping in an improper place: one of the Petty Officer's beds. He died after being involved in a car accident and was laid to rest with full military honours at Klaver Camp at the top of Red Hill (the current site of the South African Navy Signal School). The painting includes the statue of Just Nuisance on Jubilee Square as part of its subject.